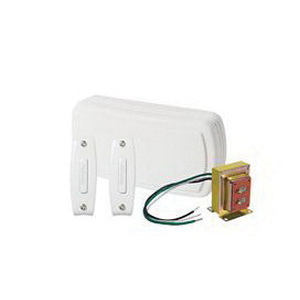 Nutone Wired builder chimes kit includes a white chime, two unlighted pushbutton and a transformer. Chime works with a 16-Volt transformer for uninterrupted service and never relies on batteries. It offers two-note chime for front door and separate one-note for second door that allows answering quickly. Two unit rectangular shaped pushbuttons with non-stick action are included for added convenience. Basic white textured cover of this chime kit is blended with builder finishing techniques for multi-family dwellings. Kit is suitable for use with two entrances.